محدوده معدن دونا قسمتی از پهنه زمین‌شناسی البرزمرکزی است. تاقدیس دونا قسمتی از یک ساختار فراجسته تکتونیکی است که در حدفاصل گسل‌‌های رانده کندوان و آزادکوه جای گرفته است. در این تحقیق سه گروه از گسل‌‌های اصلی شناسایی شده‌اند. گروه اول این گسل‌‌ها هم‌راستای محور چین‌های مهم و دارای راستای خاوری- باختری و شیب حدود 50-40 درجه و زاویه ریک بیش از 70 درجه هستند. گروه دوم گسل‌ها دارای امتدادNE-SW با سازوکار معکوس و زاویه ریک کمتر از 65 درجه می‌باشند. گروه سوم گسل‌‌ها که اولین گروه گسل‌ها را قطع می‌کنند، دارای راستای تقریبی N35W ، شیب بیش از 75 درجه و زاویه ریک بیش از 70 درجه هستند. هدف از این نوشتار بررسی ساختار معدن دونا و بررسی سازو کار سومین گروه گسل‌ها می‌باشد که در البرز عمومیت ندارند و تجزیه و تحلیلی در مورد آن‌ها ارائه نشده است. برخی از این گسل‌‌ها خش‌لغزهای بارزی نداشتند و سازوکار این گسل‌‌ها با استفاده از تهیه نقشه زمین‌شناسی 1:1000، تهیه برش‌های ساختاری و به کارگیری شبکه اشمیت و روش‌های ترسیمی به دست آمد. تغییر نوع حرکات تکتونیکی از نوع تکتونیک برخوردی به حرکات راستالغز چپ‌بر در ساختار فراجسته دونا سبب ایجاد گسل‌های معکوس جوان با راستای شمال باختری- جنوب‌خاوری شده است. The area of Dona mine is a part of central Alborz. The Dona anticline is a part of pop up structure and located between Kandavan and Azadkuh thrust faults. In this research three sets of major faults are recognized. The first category of faults with W-E trend, dip 40-50, Rake angle more than 70, are parallel to the major fold axes and second category of faults have NE-SW trend with reverse movement and rake angle less than 65. The third category which truncate the first sets, have nearly N30W to N40W direction with dip more than 75 and rake angle more than 70. The aim of this paper is investigation on the structure of Dona mine and investigations on the mechanism of third category of faults which are not popular in Alborz range and did not discussed before. Some of these faults do not have visible slickensides and the mechanism of these faults held on the basis of preparing geologic map on the scale of 1:1000, structural cross sections and implementing Schmidt net with construction methods. The change of tectonic movements from collision into sinstral, on the pop-up structure created this set of young reverse faults with NW-SE trend. سامانی­راد، ش.، 1379- زمین­شناسى، ‌سنگ‌شناسى و تعیین ژنز معدن سرب دونا در البرز مرکزى، پایان‎نامه کارشناسى ارشد دانشگاه آزاد اسلامى، واحد تهران شمال. صباحى، ف.، 1384- نحوه تشکیل کانسار دونا و اثرات زیست‌محیطی معدنکاری آن بر رودخانه­های الیکا، دونا و چالوس، پایان‎نامه کارشناسی ارشد، پژوهشکده علوم زمین. Alavi, M., 1991- Sedimentary and Structural Characteristics of the Paleo-Tethys Remnants in Northeastern Iran, Geol. soc.of Amer. Bull., V. 103, P.983-992. Alavi, M., 1996- Tectonostratigraphic synthesis and structural style of the Alborz Mountain system in Northern Iran, Journal of Geodynamics, V. 21, P. 1-33. Allen, M., Ghassemi, M. R., Shahrabi, M. and Qorashi, M., 2003- Accommodation of late Cenozoic oblique shortening in the Alborz range, northern Iran. Journal of Structural Geology, V. 25, no. 5, p. 659–672. Ashtari, M., Hatzfeld, D. and Kamalian, M., 2005- Microseismicity in the region of Tehran: Tectonophysics, 395, p. 193–208. Axen, G. A., Lam, P. S., Grove, M., Stockli, D. F. and Hassanzadeh, J., 2001a- Geological Society of America, Geology, 29 (6), 559–562. Axen, G. J., Lam, P. J., Grove, M., Stockli, D. F. and Hassanzadeh, J., 2001b- Exhumation of the west-central Alborz Mountains, Iran, Caspian subsidence, and collision-related tectonics. Geology, V. 29, no. 6, p. 559–562. Axen, G. J., Stockli, D. F., Lam, P., Guest, B. and Hassanzadeh, J., 2001c- Implications of preliminary (U-Th/He cooling ages from the central Alborz Mountains, Iran. Geological Society of America, Abstracts with Programs, V. 33, no. 7, p. 257. Babaey, S., Dehbozorgi, M. and Hakimi Asiabar, S., 2017- Assessment of active tectonics by using morphometric indices in Central Alborz, Quaterly Quantitative Geomorphological researches, 6th year, no. 1, p. 40- 56. Berberian, F. and Berberian, M., 1981- Tectono-plutonic episodes in Iran, in Gupta, H. K., & Delany, F. M., eds., Zagros–Hindu Kush–Himalaya geodynamic evolution. Geodynamics Series, Washington, D. C. . American Geophysical Union, p. 5–32. Berberian, M. and Yeats, R. S., 1999- Patterns of historical earthquake rupture in the Iranian Plateau. Bull. Seismol.Soc. Am., Vol. 89, 120–139. Berberian, M. and Yeats, R. S., 2017- Tehran: An earthquake time bomb, Geological Society of America, seattle, Washington, USA (accepted in 2016). Berberian, M., 1983- The southern Caspian: A compressional depression floored by a trapped, modified oceanic crust. Canadian Journal of Earth Sciences, V. 20, p. 163–183. Ehteshami- Moinabadi, M., 2016- Possible Basement Transverse Faults in the Western Alborz, Northern Iran. 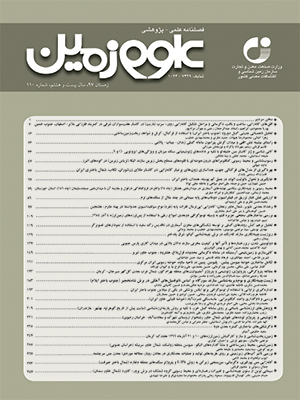 Journal of Sciences, Islamic republic of Iran, 27. 329- 342. Ehteshami- Moinabadi, M., Yassaghi, A. and Amini, A., 2012- Mesozoic basin inversion in Central Alborz, evidence from the evolution of Taleqan-Gajereh-Lar paleograben. Geopersia, V. 2, P. 43-63. Guest, B., 2004- The thermal, sedimentological and structural evolution of the central Alborz mountains of northern Iran: Implications for the Arabia-Eurasia continent- continent collision and collisional processes in general [Ph. D. thesis]. Los Angeles, California, USA, University of California–Los Angeles, 292 p.
Guest, B., Axen, G. J., Lam, P. S. and Hassanzadeh, J., 2006- Late Cenozoic shortening in the west-central Alborz Mountain, northern Iran, by combined conjugate strike slip and thin-skinned deformation. Geosphere, 2. 35–52. Hakimi Asiabar, S. and Bagheriyan, S., 2017- Exhumation of the Deylaman fault trend and its effects on the deformation style of the western Alborz belt in Iran, Int J Earth Sci (Geol Rundsch) pp. 1-13, https://doi.org/10.1007/s00531-017-1507-4. Hakimi Asiabar, S., 2010- Collision tectonics of western Alborz mountain, Ph. D. thesis (In Persian), Shahid Beheshti university, 280 p.
Hakimi Asiabar, S., Pourkermani, M., Shahriari, S., Ghorbani, M. and Ghasemi, M. R., 2011- Geological zones of western Alborz Mountains. Journal of Sciences Islamic Azad University 21.113-124. Holzer, H. F. and Momenzadeh, M., 1973- Note on the geology of Elikah and Duna lead mines, central Alborz, northern Iran. Geol.Sury. Iran, 21. 27–36. Huber, H. and Eftekhar-nezhad, J., 1978a- Geological map of Iran, sheet no. 1, northwest Iran. Tehran, National Iranian Oil Company, scale 1:1, 000, 000. Huber, H. and Eftekhar-nezhad, J., 1978b- Geological map of Iran, sheet no. 2, north-central Iran: Tehran, National Iranian Oil Company, scale 1:1, 000, 000. Jackson, J., Priestley, K., Allen, M. and Berberian, M., 2002- Active tectonics of the South Caspian Basin. Geophysical Journal International, V. 148, p. 214–245. McClay, K. and Bonora, M., 2000- Analog models of restraining stopovers in strikeslip fault systems: AAPG Bulletin 85 (2), p 233-260. McClay, K. R. and Buchanan, P. G., 1992- Thrust faults in inverted extensional basins. In: McClay; Thrust Tectonics. University of London, Chapman and Hall Pub. p. 93-104. McKenzie, D. P., 1972- Active tectonics of the Mediterranean region: Geophysical Journal of the Royal Astronomical Society, 30, p. 109–185. Moghimi, M., Arian, M. and Sorbi, A., 2015- Fault Movement Potential of Marzanabad Area, North Alborz, Iran, Open Journal of Geology, 5, 126- 135. Nazari, H., Ritz, J. F., Walker, R. T., Salamati, R., Rizza, M. and Patnaik, R., 2014- Palaeoseismic evidence for a medieval earthquake, and preliminary estimate of late Pleistocene slip-rate, on the Firouzkuh strike-slip fault in the Central Alborz region of Iran, Journal of Asian Earth Sciences 82, 124-135. Ragan, D. M., 1973- Structural geology : an introduction to geometrical techniques, New York. Wiley, 208 p.
S¸engör, A. M. C., 1990- A new model for the late Paleozoic- Mesozoic tectonic evolution of Iran and implications for Oman, in Searle, M. P., Ries, A. C., eds., The geology and tectonics of the Oman region. London, Geological Society [London], p. 797–831. S¸engör, A. M. C. and Natal’in, B. A., 1996- Paleotectonics of Asia: Fragments of a synthesis, in Yin, A., Harrison, M., eds., The tectonic evolution of Asia. Cambridge, Cambridge University Press, p. 486–640. Stocklin, J., 1974- Northern Iran: Alborz Mountains, in Spencer, A. M., ed., Mesozoic-Cenozoic orogenic belts; data for orogenic studies; Alpine-Himalayan orogens. Geological Society [London] Special Publication 4, p. 213–234. Vahdati Daneshmand, F., 1991- Amol: Geological quadrangle map of Iran. Tehran, Geological Survey of Iran, scale 1:250, 000. Zanchi, A., Berra, F., Mattei, M., Ghassemi, M. R. and Sabouri, J., 2006- Inversion tectonics in central Alborz, Iran. Journal of Structural Geology, V. 28, P. 2023.